Choosing a third party controller is pretty common, and people basically turn to specialized controllers for one of two reasons. You’re either trying to save a couple of bucks, or searching for features which don’t exist on the default controller. But third party accessories can be tough to pick. Because there are about a million different ways to mess-up a third-party adaptation of a game controller. Done carelessly, it’s like running through a minefield. If you want to make it through without getting blown up, it helps to know what you’re looking for. 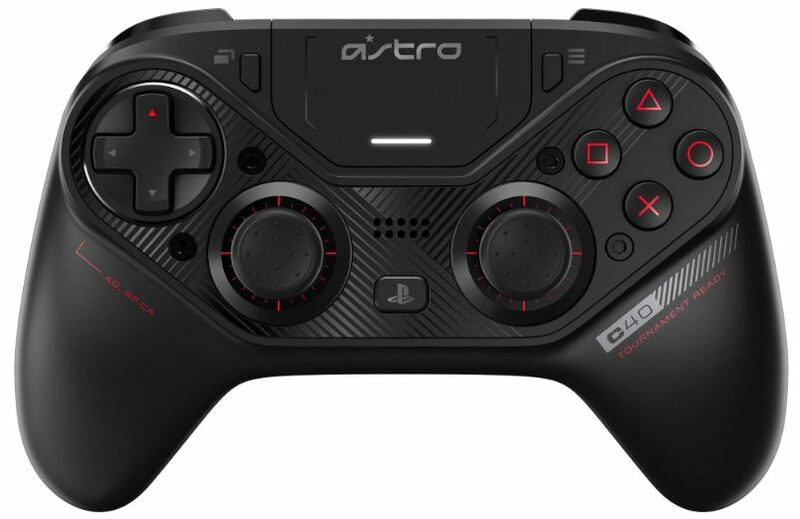 As a brand, Astro hasn’t made gamepads prior to the C40 TR Controller. But based on Astro’s previous releases, it’s fair to say that you tend to get what you pay for. Which is why the greatest weaknesses and greatest strengths of this controller are equally easy to see. When it comes to weaknesses, this controller’s biggest fault is cost. 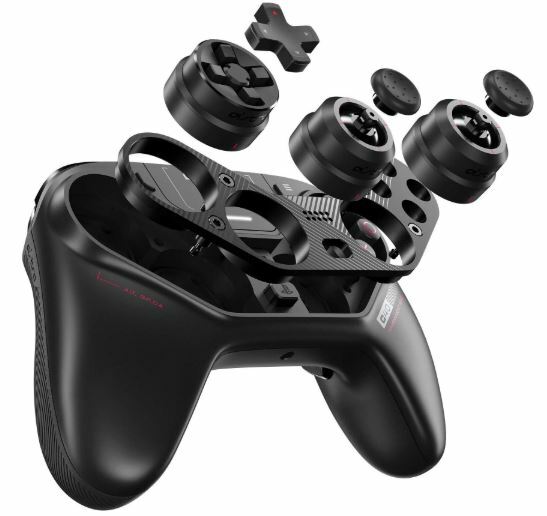 The C40 TR costs about four times as much as any standard gamepad. That will immediately turn away people who are looking for a bargain, and even people who were looking for a modestly improved gamepad. Strangely enough, from a hardware perspective, the C40 TR is arguably the strongest controller on the market. Why does it cost four times as much as other controllers? 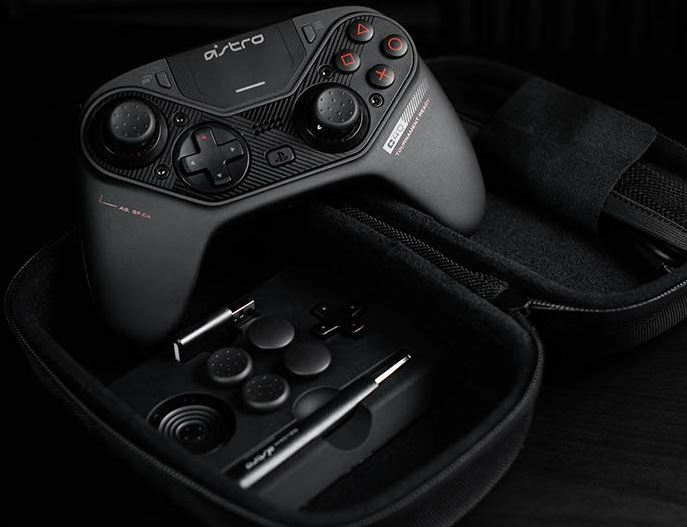 To put it simply, the C40 TR is four times the controller. 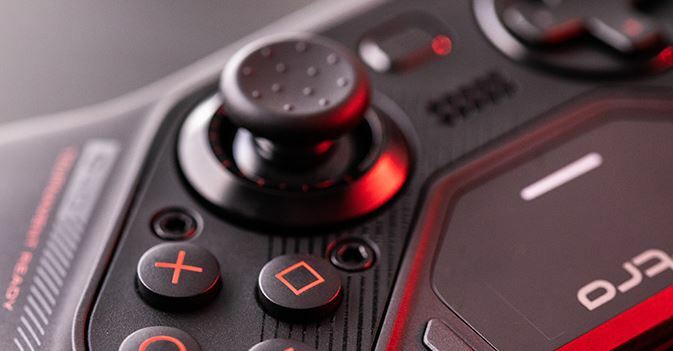 Arguably, the biggest feature Astro delivers with the C40 TR Controller is its modular design. That allows the D-pads, analogue sticks, and button interfaces on this device to be swapped in an entirely modular fashion, allowing you to select between different controller layouts as you please. But the modularity and versatility only begins with the hardware. Astro’s customization software can be used to create different profiles within the controller, letting you adjust the stick and trigger sensitivity, reprogram various buttons, make changes to your audio output settings, and so forth. You can even affect mic output. 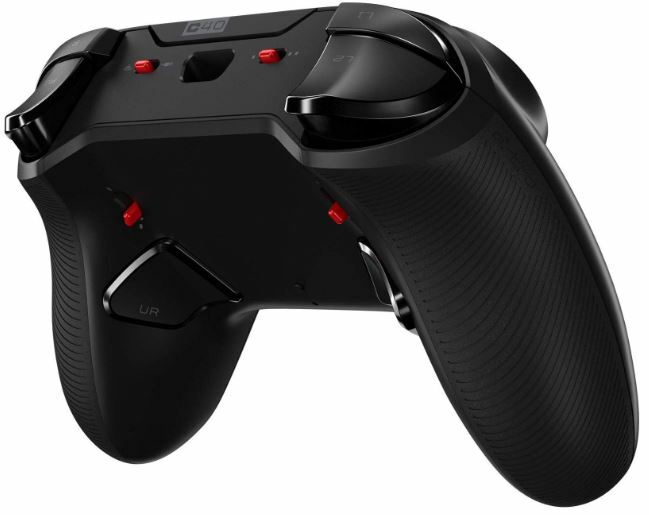 The C40 TR measures about 6.6 x 4.2 x 2-inches, making it sized similarly to a PlayStation 4 controller. Superficially speaking, this controller doesn’t look much cooler than any other mainstream controller. Though the black and red aesthetic does give off a high-end, professional vibe. Looks aside, it’s immediately clear the C40 TR Controller was made to endure rigorous use. As long as you don’t start smashing the C40 TR with a hammer, you are almost certain to never encounter issues related to wear-and-tear. The Astro C40 is about the same size as any other modern console controller, so it’s unlikely to draw many complaints when it comes to comfort. 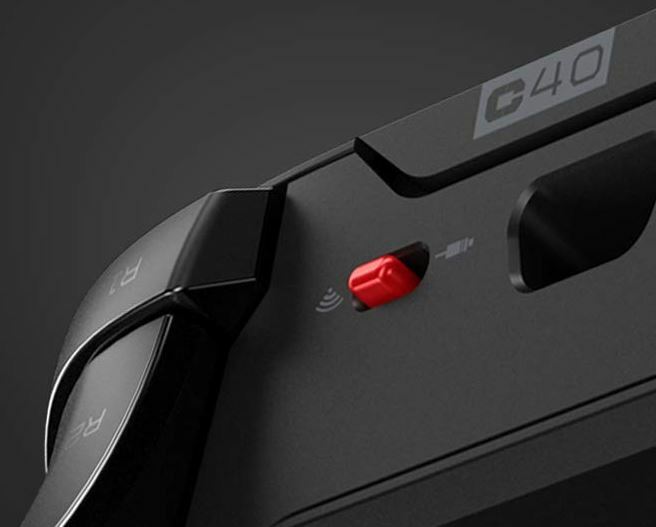 If you’re someone who prefers unusually large or unusually small controllers, then you’re probably out of luck when it comes to the C40. Viewed from the front, this controller gives the impression there is no added grip. But if you spin around to the back, you’ll find a layer of rubberized and textured surfaces. This makes it a little bit tougher to clean the backside of the controller, but this kind of grip is exactly what you want for lengthy gaming sessions. Out of the box, the layout of the controller looks pretty normal. There’s a D-pad positioned for your left thumb, a pair of bumpers, an analogue stick, and so on. 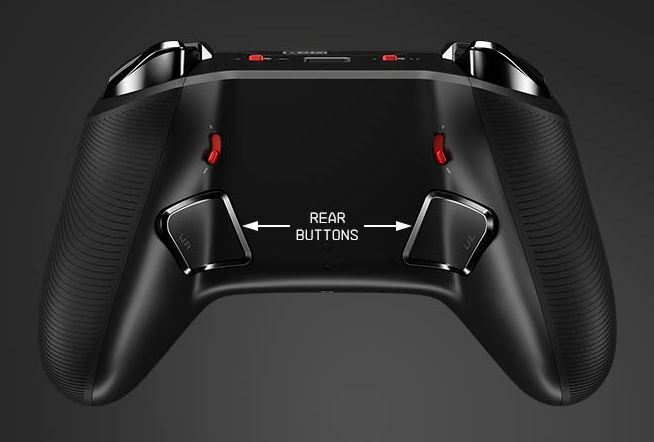 What’s not as obvious is the touch pad in the top center portion of the controller, resting between the D-pad and the right thumb’s control buttons. While the Astro C40 can be used to make exotic and unique button configurations, like a game controller with multiple D-Pads, it’s also capable of emulating the layout of basically any standard console game controller. For your core interface, the C40 TR Controller includes two analogue stick modules, a D-Pad module, and a D-Pad Plus module. Once you’ve got those modules in place, you can further customize them. Because Astro includes a pair of concave thumbsticks, a pair of domed thumbsticks, and another set of sticks which are slightly taller than the others. Additionally, Astro includes a wireless USB transmitter and 6-foot USB cable. It’s their own special 2.4GHz USB adapter, and it’s what’s responsible for allowing the controller to make lightning fast connections with your gaming devices. Specifically, it’s what enables transmission latency lower than 5ms. It’s only when you’re involved in competitive gaming that these kinds of features can really pay off. If you are, then you’ll find the C40 is basically a wireless controller with latency that’s nigh indistinguishable from going wired. It doesn’t hurt that their controller actually goes through considerably less bandwidth than a comparable controller from Sony, too. When you’re not using the wireless mode, you can switch over to a standard wired connection using that USB cable. With such great latency on the Wi-Fi connection, why would you make that switch? The answer involves battery life. There’s a downside to high performance gaming equipment. Whether you’re using a wireless gaming mouse or a wireless gaming controller, you encounter the same issue. In order to make the connection between the controller and your devices smooth, the controller needs to communicate more frequently. That means sending out signals more often, or even twice as often as similar gaming controllers. When it comes to responsiveness, that’s a wonderful thing. But it’s why the CR40 TR can provide about 12 hours of battery life, where many controllers can provide as many as 20. The 12-hour battery limit would only be worth admonishing if they had been wasting their battery on LEDs or something similar. The lifespan of the battery is only reduced because the controller is doing more for you. But if you find the 12-hours a little shallow, once again, there’s a wired mode. It’s great for if you want to play while the batteries are dry, or if you don’t actually need to use the wireless mode at the moment. You probably won’t be able to tell the difference between the 5ms wireless and the wired version. Whether or not you end up needing the extra thumbstick caps really depends on the kinds of games you play. If you’re interested in shooters and fighting games, you may find the convex and concave caps appealing. If you’re all about shooters, the elongated sticks can help give your controller precision that compares more favorably with a PC mouse. But if you play nothing but MOBAs, there’s a good chance the extra sticks won’t do anything for you. On the backside of the controller, you’ll notice a pair of tiny red switches. These can be flicked to operate hair-trigger aiming. 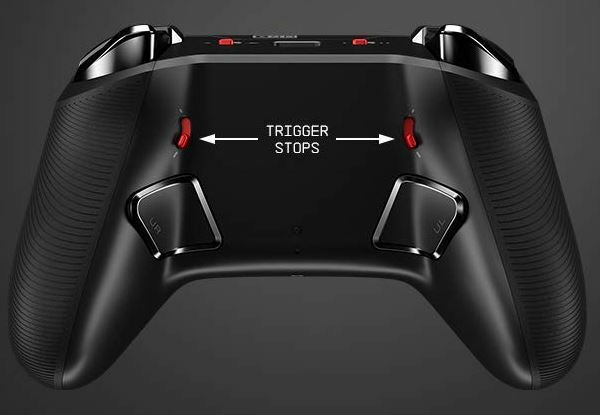 The trigger stops on the back of the controller are easy to rapidly initiate, affecting the trigger pull distance. Similar to many third party controller designs, the C40 TR Controller was built with an extra pair of rear buttons. Those extra triggers can be reprogramed, which shouldn’t surprise you much. What may come as a surprise is that you can actually reprogram those buttons using only the controller. Meaning, you can do it entirely without the use of PC software. The modularity of each portion of the controller allows the C40 TR to effectively emulate any controller layout, or even allow you to invent your own controller layout. Whatever happens to work best for you and your playstyle personally. The only portions of the device which aren’t fully modular are the handles and the touchscreen. It should hardly be surprising the Astro C40 TR includes a hard-shelled traveling case. Inside, there’s space for the controller, the various modules, stick caps, and the USB wire. It’s also pretty useful for storing and carrying the controller from place to place, almost as if Astro is anticipating this controller to be used in tournament settings or LAN settings. In addition to the variety of included accessories, you can pick up replacement accessories as needed. The accessory kit includes four medium sticks, four tall sticks, two standard domed sticks, and two standard concave sticks. It also includes an analogue stick module, D-Pad module, and D-Pad pack. If you happen to misplace one or two of your modules, it’s nice to know you’re not totally out of luck. Similar to a DualShock 4 Controller, you’re able to use the touchpad while also using an attached audio headset. Though the touchpad is mostly something that’s onboard for mobile gamers, it’s nice to know it won’t get in the way of your console gaming. Actually swapping the modules only takes a couple of seconds. Though it typically has to be done between games or matches. If you start swapping modules in the middle of a game, more often than not, you’ll find the game’s software has a tough time keeping up with the change. Who Should Choose the ASTRO Gaming C40 TR Controller? There’s a competitive advantage in always having the right tools for the job. Sometimes you might want longer sticks, giving you more precision over your aim. Sometimes you might want convex or concave surfaces, depending on the kind of grip and action you’re looking for. Gameplay advantages aside, the ASTRO Gaming C40 TR lets you change the configuration of your controller from a PS4-style layout to an Xbox style layout, and it only takes a couple of seconds. That’s pretty cool. Though, if you’re more of a casual player, then you’d certainly be better off with a simpler controller. The only reason to use the C40 TR is because you understand and appreciate everything it has to offer. From the highly responsive Wi-Fi, to the wired/wireless adaptation, to its interchangeable modules, this controller is the kind of thing you’d expect to see in the hands of e-sports professionals. You’d have to take gaming seriously to be able to appreciate half of the features this controller can offer. If that describes you, then it just might be worth trying out the C40 TR Controller.